Heriot’s skipper Iain Wilson is relishing the prospect of facing Ayr in the final of the Tennent’s Premiership. The Goldenacre men secured their spot in the title decider with a 35-10 win at home to Currie Chieftains on Saturday. It was an impressive display of game management by Wilson and his colleagues. They controlled proceedings and took full advantage of a luckless Chieftains side whose case was not helped by injuries to two front row players inside the opening ten minutes. “We felt comfortable all the way through which is a bit of a change. The last few times we’ve played Currie, it’s been a real scrap and it’s been pretty even. We’ve come out on the wrong end of it twice. 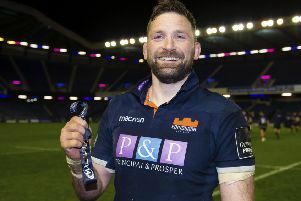 We were due them one,” said Wilson, who formed a solid back-row partnership with Jack Mclean and Struan Dewar before the latter made way for the equally imposing Jason Hill. “We’ve done a lot of work over the last three weeks and we knew we needed to focus on how they were going to play. We switched on from start, we started well and from there we were comfortable. 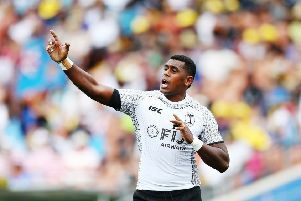 “There were a few points in the game where momentum swung and we were a little bit worried that they were getting going, but we picked it up and got back on top,” added Wilson, who is already looking forward to a repeat of the 2016 clash. The hosts employed a strategy of defending high up the pitch that snuffed out the dangerous Chieftains runners and allowed Heriot’s to dominate from the outset. They raced from the blocks and twice came close to opening the scoring. However, despite coming under extreme pressure, Chieftains held firm until the 14th minute when Charlie Simpson dotted down for the opening try. Ross Jones was off target with the conversion but booted a penalty to extend the lead. The visitors were barely in the game in the opening quarter, but they clawed their way back into the contest when Matias Argiro crashed over. However, a second try for Simpson eased Heriot’s into a 13-5 lead at half-time. Hill added a further score for the home side shortly after the restart. Jones converted and added a penalty that extended the gap. Chieftains rallied once more and Thomas Gordon bagged a try that offered them some hope. But a neatly worked try by Rob Kay and a fine solo effort by Alex Ball saw Heriot’s progress to next month’s showdown for the title away to Ayr who edged past Melrose thanks to an injury-time score. Chieftains’ build up had been disrupted by uncertainty over the availability of professionals. And a difficult task became even tougher when they suffered a double injury blow. With 13 Chieftains players on the wish lists of Super 6 teams and several others considering their futures, Cairns had hoped for a better send-off. “It’s a shame that on their last outing together we’ve had those things impede what could have been a much closer game,” he said. PRO14 rugby: Who are Edinburgh’s four new signings?